Management: Our management materials will teach you everything you need to know to be a good leader who generates loyalty and cooperation, and who knows exactly how to stay on top of things, keep things growing at a steady pace, and quickly recover from unexpected changes. See our Management materials. Human Resources: We don’t just teach you how to hire, fire and keep track of training and payroll. We show you how to find the best, get them to do what the company needs, and fix them when they’re broken. Gone are the days of high staff turnover. HR helps you turn your staff into your best investment. See our HR materials. Sales: It isn’t all up to your salespeople, but without them you’re not going to go far. Our sales training covers every aspect of successful selling: communicating, building agreement, getting through a prospect’s emotions and objections, and closing. See our Sales materials. Finance: Whether or not you have the money you need is dependent on several things. But no matter how good your product or service, and how high your sales, having enough money also depends on how you spend it. We’ll teach you how to make it, how to spend it, and how to always have it when you need it. See our Financematerials. Operations: Is your company producing at a viable level? Is the production level continually increasing so the company can grow at an acceptable pace? Do your days run smoothly without constant emergencies? Do you have a handle on all your problem areas? Are your customers satisfied? Are your products or services easy to sell? If you would like ‘yes’ to be the answer to all of these questions, check out our operations manuals. See our Operations materials. Quality Control: When a mistake is made in your company can you be sure it will never happen again? Is your company set up to catch and fully correct every responsible element of little errors so the causes of the errors don’t escalate and create disasters? Life, and business, is full of ups and downs. But with a good quality control department, the ups will be steady and the downs will be slight and quickly turned around. See our Quality Control materials. Marketing and Public Relations: A good marketing and public relations department can tell every other department of the company exactly what it’s going to take to keep current customers and get new ones. No matter what the climate, no matter how tough the economy, no matter how many businesses are failing, your marketing and PR department can make sure you stay in the game, and winning. See our Marketing and PR materials. Below you will find key books that are great to start with, to give you a taste of what the Hubbard Management System can do for your business. 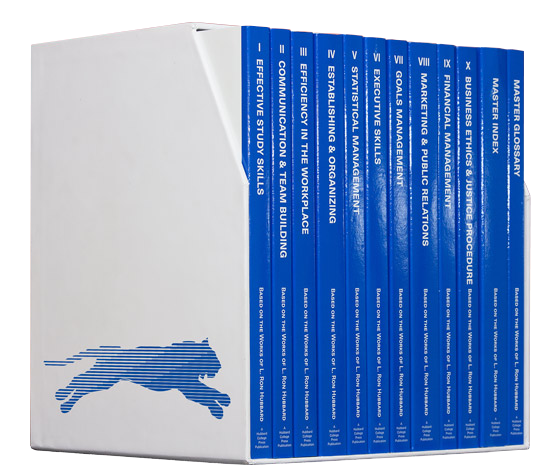 A complete set of all 23 Manuals, This set of manuals can be used for staff training – either as individual study or in workshops and seminars – or, if you are a consultant, they can be offered to your clients or prospects to help them hone in on specific problems they’re having in their business. For more books and course materials, please visit www.hubbardcollegepress.org.